i would like to thank my dear blogchildren for looking after the blog while i was gone. for those of you who didn’t figure it out… Ducky was writing the posts with very little inside info (though he was privy to very few details, so there was a tiny bit of reality mixed in with what was rolling around in Ducky’s crazy mind). that silly Duck, he was writing 3 blogs at once, and doing a great job. and Angela was takin’ care of the sissifying business for me. i’m a strict mama, as y’all know, so don’t blame her, she had orders! besides, if y’all didn’t need sissifying, she wouldn’t have had to… btw, if you haven’t checked out her blog, go there now. she’s really good, a chip off the old block. ;) i’m so proud! that’s Bikermommy there in the middle, and she took care of the bebe after she returned to town… and Pappy’s there on the right. They say that if you look at a girl’s mom, you’re seeing what that girl will look like in 20 years. Are you paying attention Frank??! Obviously Sarahk is going to keep improving with age! Ah Jonag, that was a sweet thing to say. That biker guy ain’t scary. He looks like a big ol squishy teddy bear. I grew up around them booger eatin bikers. I know what a scary biker looks like. Oh and it’s the driver of the DMB tour bus that dumped the load, and he is getting sued for it. jonag, you’re sweet, my mommy’s gonna heart you. joshua, the offtopicness of your million-times repeated DMB story is making me tired. and yes. Paul is a big teddy bear, super duper nice, unless you go to karaoke with him. then he’s a heckler. grrrr!! I think you made a mistake… obviously the young lady in the middle is a sister or a cousin. No way the young lady in that picture is old enough to be your mom! I gotta give you credit on having a biker for a bud. 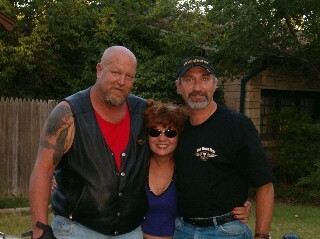 A much maligned group, bikers in my life rank among the most selfless and loyal of friends. It’s a good thing those crazy bikers are on our side. John Frenchy Kerry should be panicking now. Victory is ours.